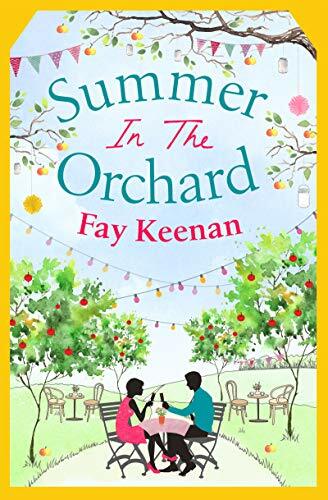 When I agreed to take part in the blog tour for ‘Summer In The Orchard’, I didn’t realise that it was actually the third book in the Little Somersby series. That doesn’t matter though because it can be read just as well as a standalone. The positive thing is that I have two other books in the series to catch up on. I am a bit OCD in that I have to read a series in order and from the beginning. Anyway enough about me so back to the review I do go. To get back to the point, I read and loved ‘Summer In The Orchard’ but more about that in a bit. I couldn’t help but take to the characters of Sophie and Alex. Sophie is a hardworking, determined, friendly, kind, genuine young lady. It’s clear that she has ambitions and that she has a list of things that she would like to do. Sophie is still grieving the loss of a parent, whilst her other parent lives abroad. Sophie lives in the same village as her grandmother and she likes to keep an eye on her. Sophie is afraid of anything happening to her Gran, who has had a couple of health scares in the not too distant past. Sophie’s love life hasn’t fared too well and her most recent relationship finished when she discovered her boyfriend getting a bit too close to his colleague. One to one time politely describes what he was getting up to. Sophie isn’t particularly looking for romance when Alex appears on the scene but it’s clear from their first meeting that they have one hell of a chemistry and sparks definitely flew. Alex is a bit of a mystery when he turns up in the village. At first he says that he is there at the cider factory to gain experience in the field because he is hoping to set up his own cider company back home. However, it soon becomes clear that he has another reason for being in the village, which isn’t immediately apparent. Alex is the mirror image of Sophie in a way – both are polite, kind, gentle, loving human beings who are not afraid of hard work. Will Sophie and Alex get together? Well for the answer to that question you are just going to have to read the book for yourselves to find out as I am not going to tell you. ‘Summer In The Orchard’ is just the sort of book I needed to read at the moment. It is a light hearted, uncomplicated, fun romantic read with characters that you can’t help but take a liking to. I would say that I became addicted to this book from the first couple of pages onwards. I just had to keep reading to see what fate had in store for Sophie and Alex. The pages turned over at speed and the time flew by whilst I was reading this book. For me ‘Summer In The Orchard’ was simply unputdownable. My Kindle wasn’t glued to my hand but it might as well have been because it came everywhere with me. The village just sounded idyllic in a way and I found that I started to compare their village with the village where I live. I could certainly recognise certain similar characteristics and I found myself nodding along in agreement. I also found that this book made me chuckle in places at something I had read and pictured in my mind. All in all, I thoroughly enjoyed reading ‘Summer In The Orchard’ and I will definitely be recommending it to other readers. I hope to read the complete series in order and from the beginning. I just know that I will enjoy the rest of the series just as much as I enjoyed this book. I can’t wait to read what Fay comes up with next. The score on the Ginger Book Geek board is a very well deserved 5* out 5*.